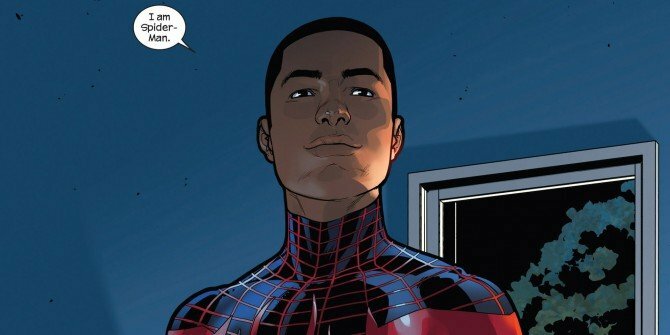 Peter Parker made his Marvel Cinematic Universe debut in Captain America: Civil War this month, but if many fans had had their way, it would have been Miles Morales joining Team Iron Man. Marvel Studios President Kevin Feige has made it clear though in interviews that the plan was always to reboot the original Spider-Man, leaving Miles’ big screen future uncertain. Well, the good news for fans of the teenage hero (who’s of Black Hispanic descent) is that a new report reveals that he’s set to be the star of Phil Lord and Chris Miller’s upcoming animated Spider-Man movie, which is currently scheduled to be released in December 2018. The LEGO Movie helmers penned the screenplay, but with Han Solo on the horizon, they’re no longer set to direct the animated feature. Beyond that, details are scarce, though it has previously been reported that the Spider-Man spinoff isn’t going to be set in the Marvel Cinematic Universe (meaning we may have to wait a while longer for a team-up between Miles and Peter). Bringing the Miles Morales Spider-Man into the spotlight is a smart decision on Sony’s part, especially as it will introduce the relatively obscure character to a huge new audience. Plus, assuming this animated movie succeeds, it’s not hard to imagine Miles swinging into a live-action setting somewhere down the road.